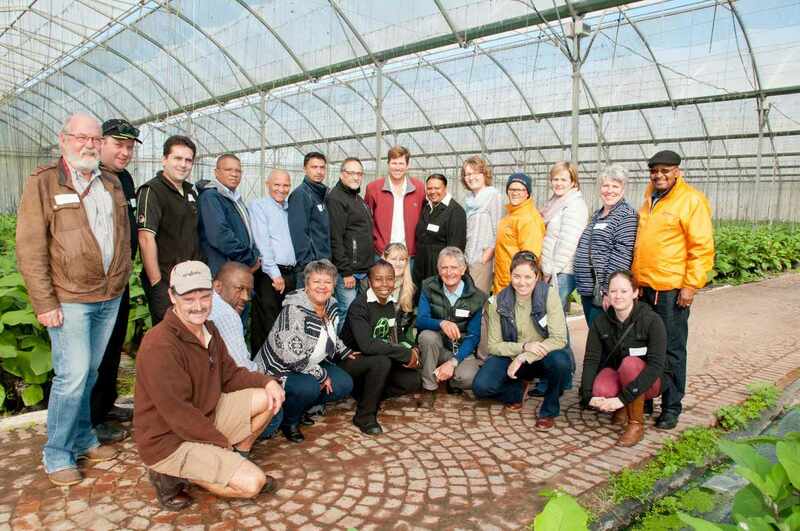 ?Friday, 12 May 2017 – The Institute of Waste Management of Southern Africa hosted a breakfast networking event at the Grass Roof on the outskirts of Port Elizabeth. Members enjoyed a brief history of the Grass Roof, presented by , Nicky Charlewood. Thereafter, Grant Dryden founder and CEO of Bountiful Grains Trust shared guidelines to composting and gardening by using the Farming God’s Way technique. Grant introduced the Farming God’s Way technique to Mike Charlewood in 2015. Since then many of the tunnels and shade cloth area on Olive Tree Farm has been utilized for planting using the technique, and a training centre has been established on the Grass Roof’s premises, “it really has been a blessing working with the Grass Roof team, if they see that something works, they get right on it!” Grant has also introduced the technique at Van Stadens Flower Farm School, St Albans Primary and Yellowoods Primary where the schools now provide fresh produce to the poor, elderly and the ill and the balance they are able to sell for much needed school funding. Following the presentation, Grant led the IWMSA members on a guided tour of Olive Tree Farm, where they could see the Farming God’s Way technique in action, “information sessions such as these expose our members to other facets of waste management, and even during the tour of the farm we were able to identify opportunities to support this initiative,” says Theo von Ruben, Chairperson of the IWMSA Eastern Cape Branch. Concluding the tour, members enjoyed a networking session whilst having a nutritious breakfast, Kay Hardy, General Manager of The Waste Trade Company and coordinator of the event was pleased to see how local relationships have grown, “most of our members now know each other by name, and by having regular networking sessions such as these we are able to strengthen ties with key stakeholders, which in turn assist our members in providing their clients with top quality service.” – Vicky du Toit, Marketing Manager, The Waste Trade Company.